Mark Khoen: MASTERING: How to save your money and build up your own mastering studio. Nowadays it's easy to throw your money in online mastering services. Very expensive and sometimes shoddy. The best way to enhance our productions is do it alone. With the same money you spent for the online mastering service of 8 tracks, you can buy a good and complete VST plug-in with professional results. So save your money, build up your studio and your professionality ! 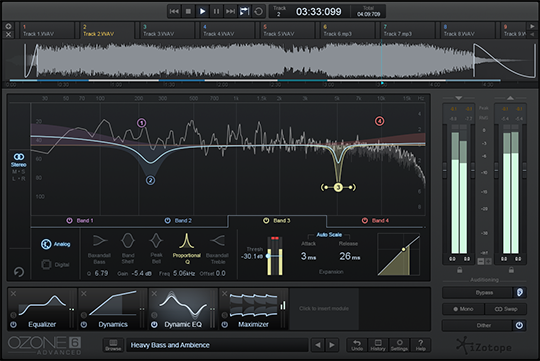 One of my favourites VST plug-in for mastering is iZotope Ozone. Historically, Ozone has been a collection of modules that for many have been the go-to solution for getting professional mastering results. The reimagined Ozone 6 user interface makes it even easier to dial in the professional sound you want. Important features are right at your fingertips, and enhanced workflows offer finer control over your results. Keep your eye on how your audio is being affected with robust metering in every Ozone module, illustrating key details like gain reduction over time. Keep an ear on where you’re improving your audio—and where you’re only making it louder—with the new Seamless Bypass control. Define your own sound with the customizable signal chain, highlighting your processing modules and signal flow with new Module Gain meters to visualize gain staging across your chain. ADV Visualize your mix like never before using Insight, iZotope’s award-winning metering suite. ADV Effortlessly add Ozone to your current mastering chain with component plug-ins for each of Ozone’s processing modules. Choose from a wealth of EQ filter shapes modeled after their classic hardware implementations. Add subtle warmth or more pronounced edge with hardware-modeled Triode and Dual Triode amplifier circuitry. 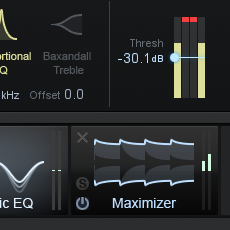 Retain a rich low end through dynamics processing with an API Thrust-inspired tilt control. Smoothly adjust between linear-phase and minimum-phase EQ filters for deeper control. Subtly compress your audio with RMS and True Envelope detection as well as variable knee control.